November is a curious time for college basketball. Most of the non-conference slate is filled with gimme games against cupcakes. The fundamental purpose for these games is money. The good teams can make money off them by filling the home stadium with fans eager to see a sure win. And that's even after paying off the bad teams to make the trip to be a sacrificial lamb. Oh sure, upsets happen, but it's relatively rare. But we also get a smattering of games against worthy opponents, almost always on a neutral court and usually as a part of some "tournament" where no matter the outcome of the opening round games, the teams that end up at the final location are pre-determined. These games are basically the opposite of the non-conference matchups described above. There's no home team, the stadiums are usually far from full, and the outcome is much more in doubt. And, further, these games are actually meaningful from a NCAA Tournament perspective. They are resume builders, and that's not a bad analogy. By the time we get to March, the predictive information to be discerned from these games has dropped to about nill. It's like a job you had 3 jobs ago. Who you were then is not who you are now, but the job you had then will be used to evaluate your next gig. Two years ago, Wisconsin was housed at Florida and dropped games to Creighton, Virginia, and Marquette in the non-conference slate. The Badgers then proceeded to go 12-6 in Big Ten play. Despite that impressive conference record, Wisconsin ended up with a middling 5-seed. Last year, the Fighting Illini beat Baylor, an eventual 3-seed, by 8 in Las Vegas. But Illinois missed on out the Tournament after finishing the year at 19-13. Beating Baylor did not portend Illinois to have a fantastic season any more than Wisconsin dropping 4 games meant the Badgers were pretenders. Coaches are still figuring out roles, and players are still adjusting to them. But these games will nonetheless be scrutinized come March, just like that assistant manager position you had 8 years ago. Non-Valentine players committed 15 turnovers, which works out to a turnover rate of about 32 percent. I'm not trying to dog this team, I actually think it's an extremely talented group. And that's why what Michigan State did was so impressive—this was an off game for Tom Izzo's team. And they beat Kansas. Speaking of off games, Maryland fans are hoping that's what they saw last night as well. It's not that Georgetown is a bad team, per se, but the Hoyas are likely not going to be on the short list of #1-seed candidates come March. But that's precisely where the Terrapins plan on posting up. It took a furious rally for the Terps to pull out the home victory. Sure, there might have been some bad luck in that Georgetown made 40 percent of its three-pointers. But Maryland was nearly identical from long range. 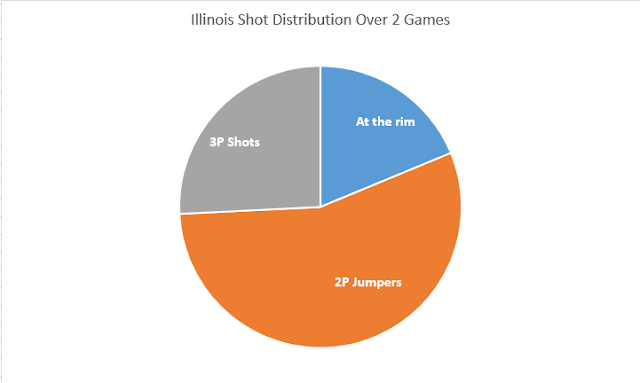 Both teams shot just as well from inside the arc as well. More troubling is the fact that the Hoyas got a higher percentage of attempts at the rim, which was more than balanced out by the fact that Maryland attempted 20 more free throws than Georgetown. Yes, good teams get to the line, but even Melo Trimble cannot be expected to routinely see 18 free throw attempts on a night where he registers just 3 attempts from two-point range. Look, bad games happen (just ask Georgetown). I'm perfectly fine with putting this game into that category and revisiting the issue when Maryland visits Chapel Hill on December 1st. But sometimes, a bad game is very telling. Which brings us to Illinois. First, let's dispense with the caveats: North Florida and North Dakota State were both NCAA Tournament teams that brought back most of their rotations this season. Illinois is playing its early-season home games in Springfield, Illinois while the State Farm Center is undergoing renovations. The Illini also have injured players, or players just coming back from injury. And finally, those two opponents shot a collective 47 percent on numerous 3s and 83 percent at the free throw line (though that's just a combined 18 FTAs). John Groce gets another opportunity to get his team on the right track against Providence at the Dunkin' Donuts Center tonight. The good news is that the Friars gave up a substantial amount of looks at the rim against Tommy Amaker's Harvard squad, so it's definitely tenable.